Pumpkin Pie CAKE – Have I Died And Gone To Thanksgiving Heaven? Pumpkin desserts are my lifeblood during the fall season. As a kid, I can remember my mother always making pumpkin pie and some sort of pumpkin cake. I loved my mom’s creations! Well, I got to thinking…why not mix pumpkin pie and cake together? You would totally have the best of both worlds if you did that! So, I searched high and low for a recipe like this and I found one on the Cooking With Serena blog. What a score! Serena easily explains the ins and outs of this recipe and just how to make it. Guess what? There aren’t any “outs”! Are ready to get the details on this yummy recipe? Flip on over to the next page for a list of ingredients and carefully thought out instructions. Enjoy! Photo and recipe courtesy of Cooking With Serena. PLEASE CONTINUE TO THE NEXT PAGE FOR COOKING INSTRUCTIONS. 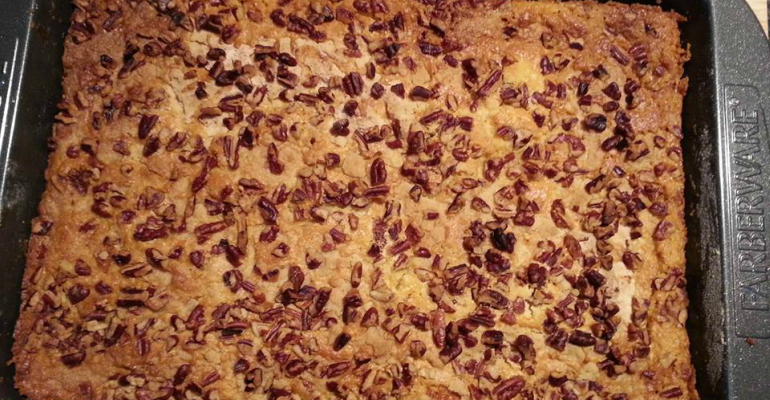 Quick Tip: This is the perfect cake to make for your Thanksgiving feast. Hot And Heavenly Cinnamon Bread Pudding – It’s A Saucy Mess Of Sweetness! Did Somebody Say Chocolate Puff Pudding Cake? Yes. Yes, We Did!